Would you like to visit a vacation spot with superb scenery, friendly people, modern accommodations and great hunting and fishing? This is a place in the tropics, but a place with warm days and cool nights. It’s a melting pot for people of many different origins. On a clear night (and they are almost always clear) you can see countless stars. After the rains, long grass covers the hills under the kiawe trees. Sounds like Hawaii, doesn’t it? But wait a moment those are not kiawe trees, they are Camelthorn Acacias, Candelabra Acacias and Terminalia bushes. In fact, you are not in Hawaii but in Namibia, in southwestern Africa. If you look at a globe representing the Earth, you will find Namibia almost precisely on the opposite side of the planet from our islands. From the preceding paragraph, you might wonder why someone would journey all the way around the world to visit a place that looks much like Hawaii in some respects. I made the journey in May, but many from Hawaii have also visited Namibia. No, I was not there to spend time with Brad and Angelina, as some have asked. However, I can assure you that they picked a wonderful country to visit for the birth of their baby. For me, the draw of Namibia was the chance to enjoy a wonderful hunt, a safari for plains game, to enjoy world-class hospitality with great people who are now real friends, and to learn about a fascinating young nation in a very ancient place. Normally, I enjoy writing. Some long-time readers of HFN will remember stories of hunting, fishing and diving that I wrote in past years. I don’t claim that they were potential Pulitzer Prize contenders, but writing them was easy. I made a trip and wrote about it. This trip was different. I spent much time thinking about what to say before I sat down at the computer. I suppose part of my hesitation is that this was such a wonderful, rich trip that it was difficult to distill the experience into a story. The other reason is that a first safari to Africa is a most special experience, even for someone who has hunted for many years elsewhere. For that reason, I have read too many stories by first-time safari participants who began with the obligatory, €œI froze in mid-crawl, the wait-a-bit thorn biting into my leg. It seemed an eternity before the big Kudu bull looked away and took a step € The opening paragraph was followed by €˜expert’ advice on how to hunt Africa. Sorry, but that seems a little much for a first-time African hunter. The continent is huge, perhaps six times bigger than the U.S. Terrain varies tremendously, as do climate and the critters you can hunt. What I will attempt to do is to convey my experiences, so this will be mostly a €œhow-to€ article. I’ll tell you why I picked Namibia, why I picked the outfit and PH I hunted with, and how it turned out for me. I’ll give you the bottom line first: I went to Namibia with high expectations and this safari exceeded those expectations in every respect. Why Africa and why Namibia? Africa is a dream for every hunter I know, as it has the largest variety of large game animals and the most storied tradition of hunting adventure. A safari is a rich and rewarding experience. Safaris are not cheap, but they actually are a bargain in some cases. You can make a plains game safari and hunt in relative luxury, taking a half-dozen fine trophies for about the price of living in a tent in Alaska to hunt a sheep or a Grizzly. I love both types of hunts, but you can have a lot of great adventure and stalk animals every day for a pretty reasonable price in Southern Africa. Like many other hunters, my plan was to do my first safari for plains game (antelopes, zebra, warthog, etc.) and then plan a second safari to include dangerous game (Buffalo or Leopard). 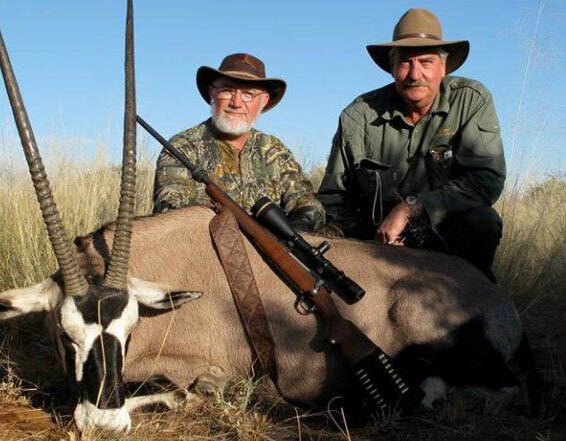 Much of the safari hunting in South Africa and Namibia is conducted on game ranches. These properties are often huge, and may have the species native to the area as well as animals introduced from other areas of southern Africa. Typically, the game is owned legally by the landowner, who must carefully manage the land to ensure enough water and adequate food sources, as well as to control poaching. Further north in Africa, much hunting is done on large government controlled concessions. This is, I’m certain, also great hunting, but cost of transportation and charter flights, plus government concession fees, tend to make this hunting much more expensive. I opted for southern Africa. Namibia was an easy choice for me, as it is sparsely populated, clean, democratic and friendly, with a superb and rigorous licensing system for Professional Hunters. Entry does not require a visa and you can bring your rifles or shotguns without difficulty (do not bring a handgun, as importation is not legal). The ranches are very large and the game is free-ranging over large properties and is wild, so is challenging to hunt. Among licensed PHs in Namibia, there are several very good outfits. I chose Hunters Namibia Safaris, run by Joof and Marina Lamprecht. Joof is one of Africa’s long-time and greatly respected PHs. It is a family operation and their oldest son, Jofie, is the other PH who operates on the ranch. I had met the Lamprechts at their booth at the Safari Club convention in Reno. My discussion with them told me they would be great hosts. My conversation with their past clients confirmed that impression, as they got €œrave reviews€. I booked a 12 day safari with them for May 2006. I opted to travel to Namibia via Atlanta and Frankfurt, Germany, and highly recommend that route. My son Mike, stationed in the Air Force in Germany, accompanied me to do photography. He is a great companion and a superb artist with a really good eye for game. However, even if I had no family reason to go via Germany, I would have done so to avoid the reported €œhassle€ in transit through the airport in Johannesburg, South Africa. If you stay overnight in Germany, customs at the Frankfurt airport will cheerfully store your guns for free. Arrival in Namibia is painless, with excellent service by Air Namibia. You will quickly clear immigration and customs, then pick up your firearm from the small police office in the airport. Simply bring the customs form (4457) you got in Honolulu and the police officer will examine the gun and then cheerfully issue you a free permit and you are on your way. I’ll now turn to the specifics of our safari. Joof met Mike and me at the airport and we had a very pleasant drive of about an hour and a half to their ranch, Rooikraal, located northeast of Windhoek. 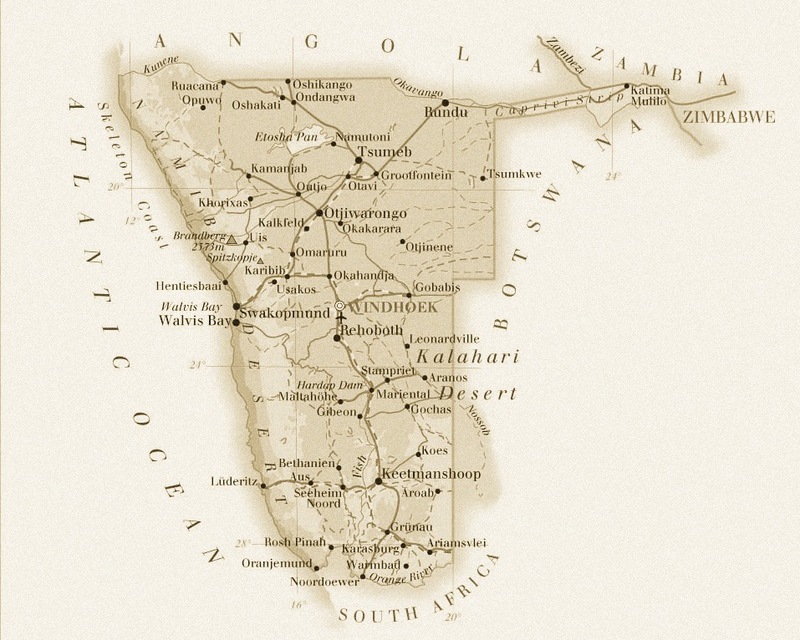 This country is part of the Camelthorn Kalahari, and is arid savannah, not true desert. It is located on a plateau that is over a mile high, and consists of gently rolling terrain studded by low but often steep hills known as kopjes in Afrikaans. The vegetation, as mentioned earlier, consists largely of various low, thorny trees such as acacias. It does resemble some of our landscapes on the Leeward coats of the islands, but with more trees. The vegetation and the rolling terrain make for plenty of cover for the animals! The primary portion of the ranch is over 50,000 acres, with added acreage in adjoining property they hunt. Joof has added a number of water sources (wells) and this makes a big difference. The game both grazes and browses, depending upon the species. Namibia is a €œthirst-land€ where game survival depends on having enough to eat in dry periods. The well-dispersed water sources allow the game to also disperse so that the animals don’t over-graze any one area. Game is abundant. We saw many Kudu, Eland, Oryx, Hartebeest and both Hartmann’s Mountain Zebra and Burchell’s Zebra every day. These are all indigenous species. We also saw lesser numbers of Springbok, plus Steenbok and Duiker, also Namibian native species. Warthogs are numerous, and Blue and Black Wildebeest, Impala and Blesbok are well distributed. Waterbuck and stately Sable are present, and Giraffes will watch you pass by. Leopards are common but very secretive. They are best hunted with hounds, and another hunter took a huge male leopard there in May. 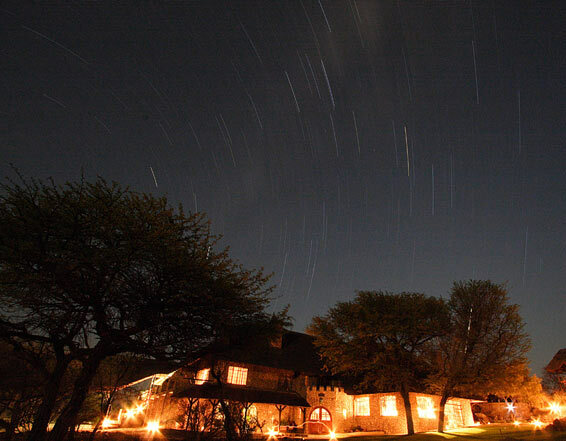 We were delighted to see Cheetahs on two occasions, and Jackals, Bat-eared Foxes and Meerkats entertained us regularly. It is a bird-watcher’s paradise, and I added 91 new species to my list. The biggest, of course, were Ostriches, which are both native and well-distributed here. They can be hunted as well. However, unless you can run at 45 miles per hour, I think you would need to stalk carefully, as they are truly wary. All of the dangerous game animals can be hunted in Namibia, and I think it will become a great Elephant hunting destination, but for the dangerous game other than Leopard (Lion, Elephant and Buffalo), you will need to visit Damaraland, the Caprivi Strip and other far northern areas. The accommodations and the hospitality at Rooikraal are, simply put, five-star and the best I have ever enjoyed in my long life. Laundry is done daily, the rooms are spacious and beautifully decorated, the staff is truly professional and everything is done with a smile. Marina’s touch as a decorator and hostess is evident. The food is simply as fine as any at Alan Wong’s or John Dominis. Venison from the hunt is usually featured, and if there is a non-delicious animal at Rooikraal, we didn’t find it! Every evening, home baked cookies decorated with a small bouquet will be by your bedside on return. Friends, this ain’t roughing it! A typical daily routine consist of a pre-dawn breakfast, and then you drive through the ranch in the safari car, with the tracker in the back in an elevated position. When game is spotted, you dismount and begin a stalk. At times, we also hiked through promising areas and glassed for game. Joof is insistent that game be taken in fair chase and on foot, and I absolutely agree with him. This is real hunting, although not strenuous. 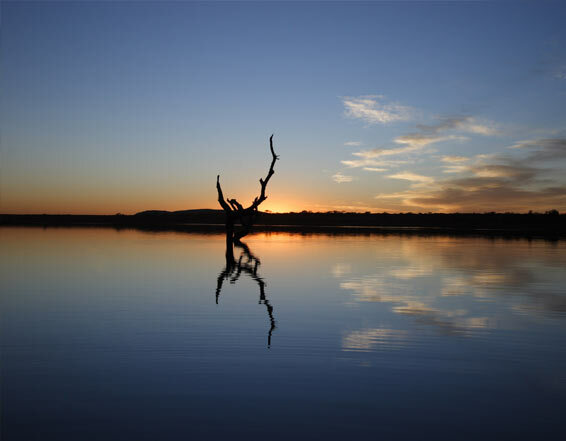 Following a morning hunt, punctuated by a coffee stop at a scenic point or a waterhole on the ranch, you will return to the lodge for a delicious hot lunch (okay, a gourmet feast) and a much-needed siesta. You will then gather for coffee in mid-afternoon and then hunt until darkness. First order in the evening is €œsundowners€ (cocktails) around the fire pit, and then the drums call you to dinner, another true feast. Then it’s off for a hot shower and a very comfortable bed. Diversions in the evening include watching Oryx come to graze at the edge of the lawn, seeing a Kudu ghost by in the scrub at the edge of the light, and listening to the Jackals call. An astronomer would love this place you can actually read by the starlight due to the extremely clear skies. Some people arrive for a safari with an iron-clad list of what they want to shoot. My approach was to let Joof teach and guide me and to let the animals tell us what we would take. I think it worked well. I did take a very nice Oryx (Gemsbok) despite a poor shot on my part, which allowed the animal to go a long way. I took a very nice Eland bull, an excellent Kudu, a beautiful Hartmann’s Zebra (delicious, by the way) and good Impala and Red Hartebeest. The Warthogs got the best of me. We saw many, but both Warthogs and I are short and the grass was tall, so tusk appraisal was tough. I took and missed a shot at a nice pig just at dark on the last evening. In fairness, we really didn’t actively look for Warthogs until all the other animals were taken. A word about shooting is in order now. Given the amount of cover, animals can be stalked, and shots are not as long as you may have read about. We took shots from about 70 yards to perhaps 220 yards, with the average perhaps around 140-150. Two things I learned were that you need to get into position smoothly and quickly, without a lot of added motion, to avoid alerting the animals. This is common to other types of hunting, but the difference here is that there is not often a chance to take the shot from behind a rock or log that you can use as a rest and for cover. Therefore, point two is that crossed sticks are used. You stand and place the rifle over the crossed sticks, padded by the hand with which you hold the fore end of the rifle. You need to remember to stand €œsquare€ to the sticks, not with one foot well-ahead of the other, as we usually shoot. The bottom line is that this is an easy and effective technique, but it will be good to practice with crossed sticks before you leave home. Accuracy and getting the shot off quickly before the animal spooks are the keys to success here. Finally, a word or two about €œstuff to bring€. Namibia is in the tropics, but it is at a fairly high elevation and as with most arid climates, it is warm in the day and cools rapidly at night. We had daytime temperatures in the mid to high 70s and then from 45 to 50 at night. The last two days, a cold front blew in from the south (as in the Antarctic) and the temperature dropped below freezing by dawn, with a nice brisk breeze. Believe me, in an open safari vehicle you will want a good jacket, light gloves and a balaclava or ski mask wouldn’t hurt. I took both shorts and long pants, but used the long pants and long-sleeved shirts most, both for warmth and for thorn-protection. Take washable cotton (remember, laundry is done daily) and take dark tan or olive drab (not camo). The light tan color is too conspicuous in Namibian brush. For boots, wear comfortable hunting boots with a soft, quiet sole. I used a .338 Win Mag and was pleased with it. Some of the animals are very large and some are pretty tough. I think something between a .30-06 and .338 with well-constructed, tough bullets is about right. Okay, this has been a mix of €œhow-to€ and €œwhat it was like for me€. I’ll try to put it all together at this point. I would rate this safari as top-notch in every respect. I learned a great deal. Mike and I had a wonderful adventure in a great place. Namibia is very safe, beautiful and friendly. Our hosts, the Lamprechts, provided simply the best accommodations and hospitality I have ever experienced on any vacation. The hunting itself was exciting and extremely productive. I do not score animals to place them in a record book, and I was specifically interested in hunting old mature males, those past prime breeding age where possible. 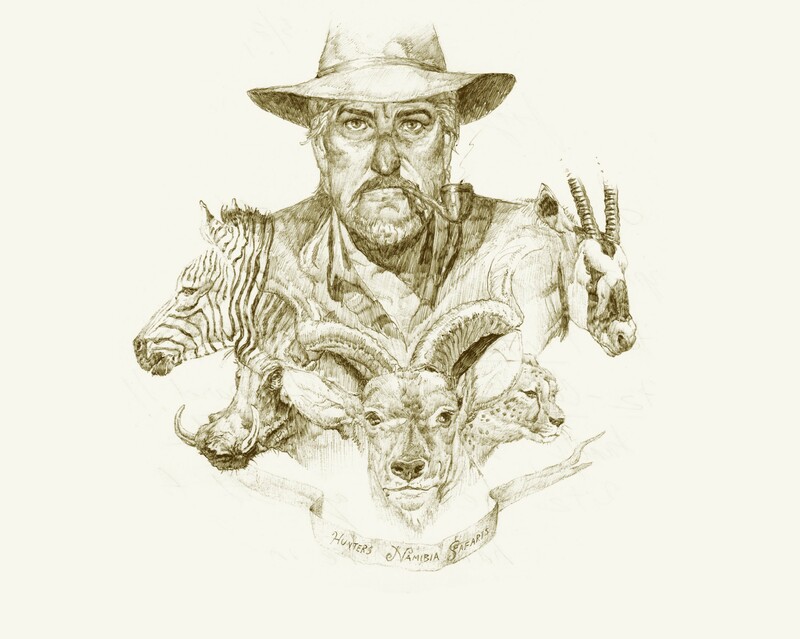 This seemed to mesh well with Joof’s philosophy of nurturing the herd and hunting old surplus animals, so that future hunters will enjoy the bounty of animals roaming this land as they have done for thousands of years. That said, I would note that a very cursory look at raw horn measurements indicates that each of the animals would score well into the Safari Club International record book, which is a measure of the quality of the animals found at Rooikraal. This was a great first safari. Do I now €œknow€ Africa, or even Namibia? The answer is obviously €˜no€. However, I do know a bit about a very beautiful part of Namibia, and I have seen and taken some great animals. I have enjoyed the friendship of wonderful hosts, the Lamprechts, and their great staff. I have seen how they care for their land and protect the wildlife, and I have seen their superb work in providing a good education and health care for their staff and the local community. I have seen a young but justly proud nation where people of all races and tribes are pulling together with a confident eye on the future. I have seen first-hand evidence that big-game hunting-trophy hunting if you will- provides the economic incentive to care for the land and the income that allows local people to increase their standard of living while supporting robust wildlife populations. What a contrast with nations that do not support hunting, and where rampant overpopulation and destruction of habitat leave a bleak future for wildlife. The Namibian solution, as practiced by the Lamprechts, is to ensure a bright future for man and wildlife together. This was a great first safari. God-willing, it won’t be my last, nor will it be my last visit to Namibia. There is so much more to do and see. The magnificent park at Etosha, the Skeleton Coast, Springbok hunting deep in the Kalahari, shark fishing at Walvis Bay the list goes on. The Lamprechts can make it all happen for you. You may contact them at www.huntersnamibia.com. If you would like more details on how to plan a hunt, please email me at richard.m.may@lmco.com.